This is the green wheel you’ve been seeing in the majority of my recent videos. They have consistently been under my feet for the last 4 months since March and I can say, they are easily one of the best wheels I’ve skated. 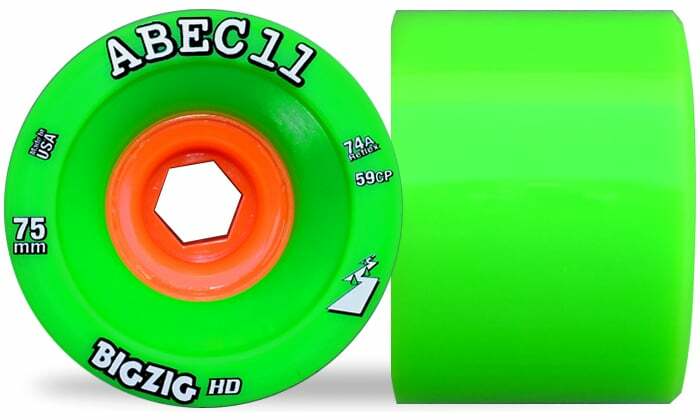 Before I bought these Abec 11 HD Big Zigs in reflex thane, I heard all sorts of things about them; how grippy and uncontrollable it was and how much chatter they’d be when I slide etc. I also heard about how fast rolling of a urethane it is and how grippy it would be. All of the above were true in varying degrees but changed slightly as the wheel wore. In my review, I’ll go over my experience with the wheel. I’ll mostly be focusing on what the wheel felt like AFTER the skin wore and what it felt like for day to day riding. Was it as grippy and as chattery as they said it would be? Should you get this wheel? They come in two different Urethanes. You have reflex and classic thane. The classic thane slides smooth and thanes a bit, whilst the Reflex is the grippier and faster rolling of the two, and thats what I picked. Yes, the urethane did have a tendancy to skip on the pavement, but this would only happen if I didn’t have my weight on the wheels/over the urethane. 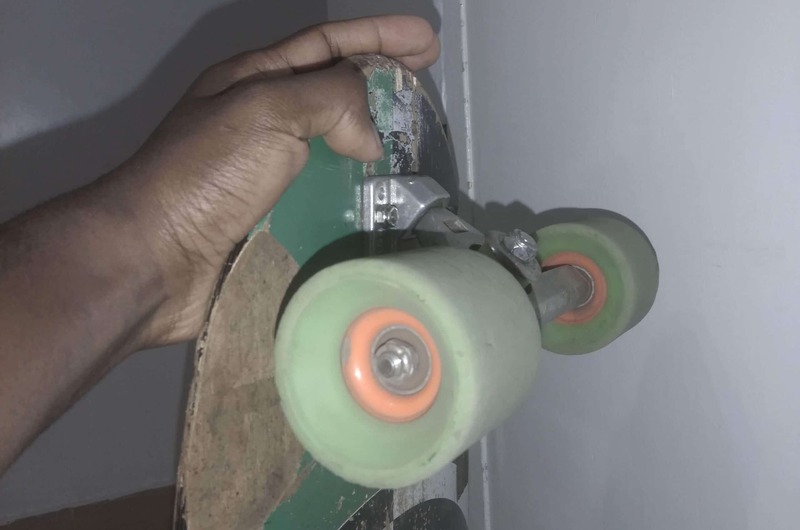 If your wheels stick out on your board or if your trucks are too wide, then you’ll have an issue with getting these to slide smoothly. As well if you don’t have most of your weight on your board and your feet are fully flat on it. When you do have your weight on them, they slide smoothly, beautifully and feel like butter. Honestly, one of the best feeling wheels that I have ridden. Once you figure that sweet spot and get your weight perfectly during the slide, these will make you a happy person. They slide so nice you feel like you’re cuddling and hugging the pavement. They do grip well and have good stopping power. They are narrower than my Cult Raptures, but they grip better and slow you down more. They might feel like they will buck and throw you off at first, but they can be tamed and it will take a bit for you to get used to them. And, the more you wear them down, the easier they feel to slide. You can check these wheels and find out their price on Amazon.com. Can now skate this road in its entirety in one lane. It's not at all hard, but it plays in your mental. Though their core isn’t too big, the reflex urethane is super dense and allows these wheels to roll fast. I was easily going a kilometer or 3 faster on these wheels when they were fresh, compared to my other DH wheels. They have been consistent with this speed up till I wore them down past 64mm. They still roll fast and feel better than loads of other downhill wheels at 64mm. For a wheel this narrow, I’m surprised they have lasted as long as they have done. With 4 months of consistent riding, they haven’t yet reached their core and still have a lot of urethane left. Whats more crazy, they still feel great to ride and slide at their size. They still ride well and slow me down enough that I haven’t yet needed to worry about buying other DH wheels. Given how affordable they are, this wheel is amazing value for money. They last long and do everything well. They compete with wheels on the higher end of the price spectrum and give them competition for day to day riding. Beginners won’t enjoy riding these. I recommend the Classic thane versions because they are easier to ride and more forgiving in the slides. Riding the Reflex versions the first couple of times is like getting into a street fight with a cat. They are grippy. If you don’t have good traction on your board, they will feel difficult to handle and won’t be enjoyable to ride at all. I recommend grip like Seismic Lokton or cheaper Mob coarse grip. Grip like Vicious, Blood Orange, Ganster etc. may not cut it. I highly recommend this wheel to advanced riders and advanced beginners looking for a bit of a challenge. It is really fun to ride and I’m personally gonna be buying more sets down the line. If you’re a beginner, like I said, you might not be able to handle this wheel just yet. That being said, they do roll really well so will make good cruiser wheels for you. 74a is a soft wheel most downhill seem to be 78 or 83. How do you find the harder wheels like 83? Some seem to like it best. Yeah, thanks to the big core and the dense urethane, the wheels done feel sluggish and actually go pretty quick. Might do a guide on wheels, core and urethanes later. Hmmm, I don’t like them cause they are too slippery/icey, but they do last long and don’t flatspot easily. I feel like softer slidey wheels are better for stand up slides because of the extra control.